Carney with the New York Giants in 2008. John Michael Carney (born April 20, 1964) is a retired American football placekicker. He was signed by the Cincinnati Bengals as an undrafted free agent in 1987. He played college football at Notre Dame. Carney has also been a member of the Tampa Bay Buccaneers, San Diego Chargers, New Orleans Saints, Los Angeles Rams, Jacksonville Jaguars, Kansas City Chiefs, and New York Giants. He was a Pro Bowl selection with the Chargers in 1994 and with the Giants in 2008. When he was released from the Saints' active roster in December 2009, Carney was third on the NFL career scoring list with a career total of 2,044 points. He was the last remaining player from the 1980s still active in professional football. He has also worked as a kicking consultant for the Saints. Carney attended Notre Dame and played football there from 1984 to 1986. He was named to the Notre Dame's all time team by Sports Illustrated. After going undrafted in the 1987 NFL Draft, Carney was signed by the Cincinnati Bengals as an undrafted free agent. He was released prior to the regular season and spent the year out of football. Carney played five games for the Tampa Bay Buccaneers between 1988 and 1989, converting two of five field goal attempts and all six extra point attempts. Carney attended training camp with the San Diego Chargers in 1990, but did not make the final roster. Carney played one game for the Los Angeles Rams in 1990, but did not attempt a field goal or extra point. He was the last remaining active Los Angeles Ram, until the team moved back to Los Angeles from St. Louis in 2016. Carney was re-signed by the Chargers during the 1990 season, appearing in 12 games for the team and converting 19 of 21 field goal attempts. He played 11 seasons with the Chargers through the 2000 season, earning his first Pro Bowl selection in 1994 after going 34-for-38 (89.5 percent) on field goal attempts. To this day, he remains the Chargers' all-time leading scorer. Carney signed with the New Orleans Saints as a free agent prior to the 2001 season. Carney missed an extra point after a famous play during a game between the New Orleans Saints and Jacksonville Jaguars that took place on December 21, 2003. The Saints were trailing 20–13 and were down on their own 25-yard line with seven seconds left in regulation. The play that then transpired became known as the River City Relay, which gave the Saints a touchdown, and a chance to send the game into overtime. Carney missed the extra point and the Saints lost to the Jaguars 20–19. Even if the Saints had won, however, they would not have made the playoffs as the Cowboys won their tenth game (nine games being the highest the Saints could have won if they won this game) and the Seahawks would win ten games to claim the wild card. Carney kicked a game-winning field goal against the Carolina Panthers following Hurricane Katrina. He then graced the cover of Sports Illustrated with quarterback Aaron Brooks on September 19, 2005 as the city celebrated this victory. On April 5, 2007, Carney asked and was given permission to leave the Saints after their acquisition of kicker Olindo Mare. Following Week 1 of the 2007 NFL Season, Carney signed with the Jacksonville Jaguars replacing injured placekicker Josh Scobee. Carney appeared in eight games for the Jaguars in Scobee's absence, converting nine of 11 field goal attempts and 20 of 21 extra point attempts. He was released on November 19 upon Scobee's return. On November 26, 2007, the Kansas City Star reported that the Kansas City Chiefs would sign Carney after holding tryouts to replace Dave Rayner – making Carney the fourth placekicker to play for the Chiefs within a one-year period, following Lawrence Tynes, Justin Medlock and Rayner. Carney appeared in five games for the Chiefs, going 3-for-3 on field goal attempts and 7-for-7 on extra point attempts. Carney with Jeff Feagles in 2008; in their 40s both were kickers for the New York Giants. 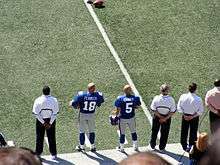 On August 30, 2008, Carney signed with the New York Giants to fill in while Tynes recovered from a knee injury sustained in training camp. Although Tynes would eventually recover from his injury Carney continued to hold on to the starting position and Tynes was relegated to kickoff duties. At age 44, Carney was the oldest active NFL player during the 2008 season. After a near perfect season (35-for-38 on field goal attempts with two blocked), Carney was chosen as the starting kicker for the NFC for the 2009 Pro Bowl. Carney was not re-signed after his contract expired, leaving him a free agent entering the 2009 season. Following the announcement that New Orleans Saints placekicker Garrett Hartley would be suspended the first four games of the 2009 season, Carney returned to New Orleans on August 15 on a one-year contract. With his start on November 30, he became the sixth player in NFL history to reach 300 career games. Carney was waived on December 22, two weeks after Hartley regained the starting job. On December 24, 2009, the Saints announced that Carney had been hired as a "kicking consultant", with responsibility for the snap and hold as well as working on kicking with his successor, Hartley. The appointment meant that Carney was ineligible to kick for any team for the rest of the 2009 season. Carney remained with the Saints in this capacity through the playoffs, and received credit for his role in preparing the comparatively inexperienced Hartley to make a number of critical kicks that helped the Saints win their first Super Bowl. Carney started the 2010 season without a team. However, after Hartley missed 3 out of 7 field goal attempts during the Saints' first 3 games, including a short kick in overtime that would have won a game against the Atlanta Falcons, the Saints re-signed Carney (while also retaining Hartley) on September 28, 2010. The signing made him the oldest active player in the NFL at the age of 46. On October 3, 2010 he kicked three field goals in a Saints win against the Carolina Panthers, and became the third oldest player to play in an NFL game (behind only George Blanda and Morten Andersen). On October 12, the Saints released Carney for the third time. Carney is married to Holly Marie Carney. He has 3 children. He runs a pre-season kicking training camp in San Diego for professional kickers called "The Launching Pad". 1 2 Triplett, Mike (December 22, 2009). "Former New Orleans Saints kicker John Carney discusses his release". Times-Picayune. Retrieved 2009-12-25. ↑ "Weekly Top 20 – Scoring". Pro Football Hall of Fame. Retrieved 2009-12-25. ↑ Giants Sign Carney, 44, At Kicker Archived September 29, 2008, at the Wayback Machine. ↑ "Archived copy". Archived from the original on 2010-10-03. Retrieved 2009-06-22. ↑ Luke, Michael (August 15, 2009). "Saints sign kicker John Carney". wwltv.com. Retrieved August 15, 2009. ↑ Hogan, Nakia (December 24, 2009). "John Carney returns to the New Orleans Saints as a kicking consultant". Times-Picayune. Retrieved 2009-12-24. ↑ Berardino, Mike (February 4, 2010). "Even as consultant, John Carney helps Saints make Super Bowl". South Florida Sun-Sentinel. Retrieved 2010-02-17. ↑ D'Angelo, Tom (February 3, 2010). "Cardinal Newman great John Carney gets a kick out of helping Saints hero Garrett Hartley handle pressure". Palm Beach Post. Retrieved 2010-02-17. ↑ "John Carney back with Saints". ↑ Handwerger, Bradley (2010-10-03). "Carney strikes again for Saints". WWL-TV. Retrieved 2010-10-03. ↑ "Archived copy". Archived from the original on 2013-01-23. Retrieved 2012-10-01.